As a Real Estate Agent working in the area of Atlanta and the Cities North, I receive a lot of email from clients, vendors and our local MLS (Multiple Listing Service). One email caught my eye and I wanted to share the data to the general public as well. They say a picture is worth a 1000 words, so here is one that I wanted to share sent to me by our local GAMLS. Last year, truck rental giant Penske reports the No. 1 moving destination City in America was Atlanta. 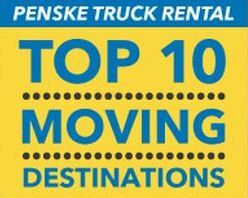 Below is a list provided by The Penske Moving Company on the top moving destinations in America for 2013, gathered from reservations data. If you are considering listing your home and do not know if the Georgia Real Estate Market has started to recover, I am here to say fear not. The numbers do not lie and interest rates are down. RE/MAX Real Estate Listings site at www.NorthAtlantaHomeTeam.com to check out the Atlanta area listings currently for sale. Enjoy! This entry was posted on Tuesday, March 4th, 2014 at and is filed under Let's Talk Real Estate. You can follow any responses to this entry through the RSS 2.0 feed. Both comments and pings are currently closed.